So I can’t make traditional fudge. At all. I fail EVERY TIME (except that one time my sister helped me make it, and watched my every move). 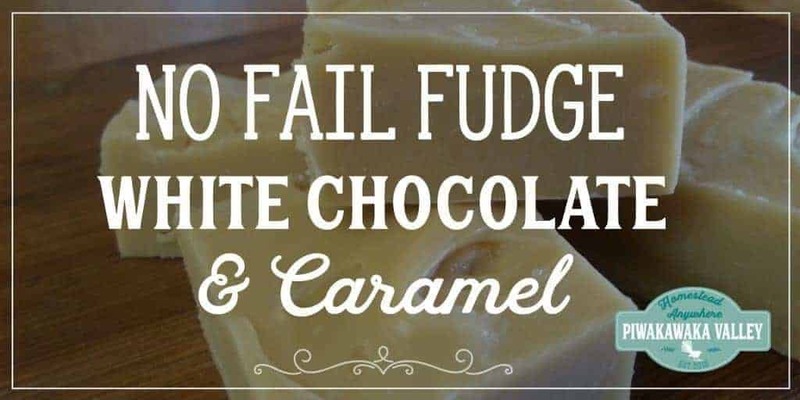 What I can do, however, is make this no fail fudge, White Chocolate and Caramel Fudge. It is amazing. Like hide-it-from-everyone-else amazing. No fail fudge is the best option for gifts for people that you don’t know what to buy for. They will ask you for this recipe, I promise it is that good. White chocolate and caramel is the ultimate combination for a sweet treat. The technique making this fudge is different to traditional fudge, but the difference means that it takes the guess work out of how long to stir to melt the sugar, how long to boil to set point, how much to cool before beating and how long to beat it for. The genius is that the technique takes the difficult skill out of the recipe. Just follow the directions and it works! Melt in a pot 125g (4 1/2 oz) of Butter. Add 2 Tablespoons golden syrup, 1 Cup firmly packed brown sugar, 1x 375g (14 oz) tin of sweetened condensed milk. Stir constantly over a medium heat until it starts to boil, turn it down to low and continue to stir and simmer for 10 more minutes. Remove from the heat and add 1 Cup (or 4 1/2 oz) of white chocolate buttons/melts. Stir well until all the chocolate is mixed in and melted. Pour into your prepared tin and pop in the fridge for 2 hours to set. Cut and hide it in your favourite hiding place. Consume within 10 days. You can switch it up a little and add 1/2 cup of chopped glace ginger. Or swap out the white chocolate buttons for dark chocolate ones and add 2 Tablespoons of cocoa into the pot while you are mixing in the sugar. Delicious! Let me know in the comments if you have made this! What do you think? I Emma, sorry for the confusion, C just means cup, I have corrected it to make it more clear. The fudge looks wonderful and I would like to make it. What is golden syrup? Hi Linda – I have just discovered that golden syrup is a UK/colonies thing! According to a forum I saw, you can replace it with corn syrup, or buy it in the international section of your store. Golden syrup or light treacle is a thick, amber-coloured form of inverted sugar syrup made in the process of refining sugar cane or sugar beet juice into sugar, or by treatment of a sugar solution with acid, it tastes similar to brown sugar. Thanks, putting the ginger in sounds like a great idea. We like to buy fudge when we vacation at the beach. I haven’t really made my own much. I always avoided making it – I bought it a lot though! Then I found this recipe, it is amazing! Hahaha Christine – It would be eaten before it got to the courier company! I’ve never made white fudge… something just seems wrong about fudge being white! 🙂 However, I agree it looks great and I know my family would love it… especially the one son who does not like chocolate! Thank you for the recipe… and precise directions. It is so very yummy! I like a good dark fudge too, and in an experiment, I discovered that you can add 2 Tablespoons of cocoa to the pot and use dark chocolate buttons to make a very tasty brown chocolate fudge!